One of the most difficult types of cases we see in our day to day practice is the foreign body. Young dogs are particularly susceptible, but dogs of any age can ingest something they shouldn’t and cause a potentially fatal health crisis. Over the many years we have been in practice, we have seen a lot of different instestinal foreign bodies: clothing, towels… even rocks. Perhaps the most upsetting type of foreign bodies is the dog toy. Nothing hurts more than getting a toy for your pet and then learning that it has seriously endangered his or her life. It is critical that you bring your pet to the veterinarian as soon as you suspect your pet has eaten something dangerous. Don’t wait to see if they pass it! The longer a foreign body is in place, the greater the danger that fatal complications may arise… bowel perforations, sections of the instestine becoming necrotic, and loss of overall bowel motility. Objects like rope bone toys, when swallowed by your pet, become “linear foreign bodies.” This means that, as they unravel, they can affect huge stretches of instestines. As the smooth muscle of the bowel tries unsuccessfully to move the object, it causes the instestine to “squash” together like an accordion which blocks blood flow and brings bowel motility to a halt. The friction of a linear foreign body can also perforate the bowel, releasing bacteria into the abdominal cavity and leading to sepsis. 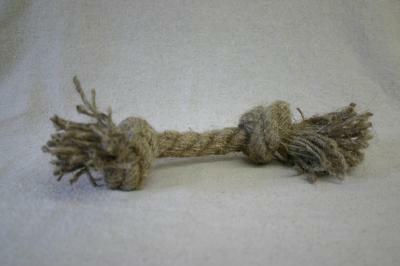 Rope bone toys are distressingly common at pet supply stores, homes, and even pet care facilities. Don’t buy these types of toys, and put them out of reach of your pet if you happen to be somwhere that has them.